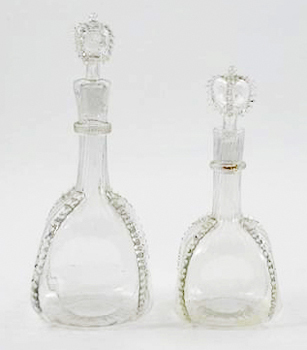 Records date back to 1720 for a small glassworks off London's Fleet Street, but Britain's longest running glass house, best known as the Whitefriars factory, really came into its own when James Powell purchased the business for his three sons in 1834. 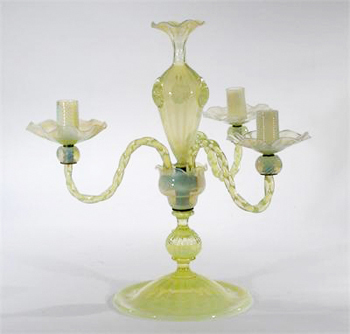 It was under the aegis of the Powell family that Whitefriars led fashion and technology in the manufacture of domestic decorative and table glass for a century and a half. Largely forgotten in the years following its closure in 1980, in more recent times Whitefriars has enjoyed a vibrant collecting revival as collectors, dealers and the museum community reassess a broad spectrum of high quality, handmade glass that epitomise design movements from the Arts and Crafts to the Swinging Sixties. A vast archive of watercolour designs by James Powell & Sons at the Whitefriars Glassworks for stained-glass windows in churches throughout Britain and others in the US, Australia, Malta, Italy and Sweden appeared at Roseberys in September 2017. 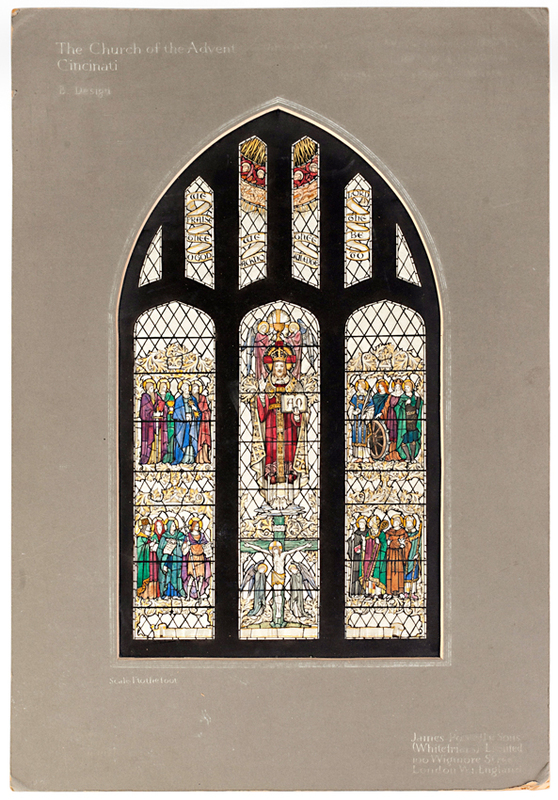 This design for a stained-glass window at the Church of the Advent, Cincinnati was part of a lots of more than 200 designs which sold together for £4400. Stained glass windows, made to satisfy the Victorian church building boom, accounted for a large portion of production and profit during the early part of the James Powell & Sons period. It was not until the second half of the century, when the family began their close association with leading designers at the forefront of the Arts & Crafts movement (specifically the architect Philip Webb who designed a range of glass vessels for William Morris at the Red House) that the factory began its trademark range of domestic tableware inspired by historical glass. 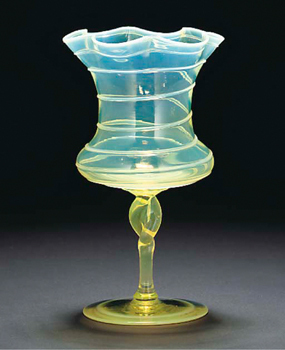 Largely eschewing the standard heavily cut wares (John Ruskin, a close associate of the factory pronounced that "all cut glass is barbarous"), these early wares in the manner of Venetian and Roman glass are characterised by their relative plainness and the use of a range of ancient decorative techniques such as threading, trailing, tears and the application of prunts. Whitefriars' rise to cutting edge status was accompanied by the arrival in 1875 of Harry James Powell (grandson of the founder). 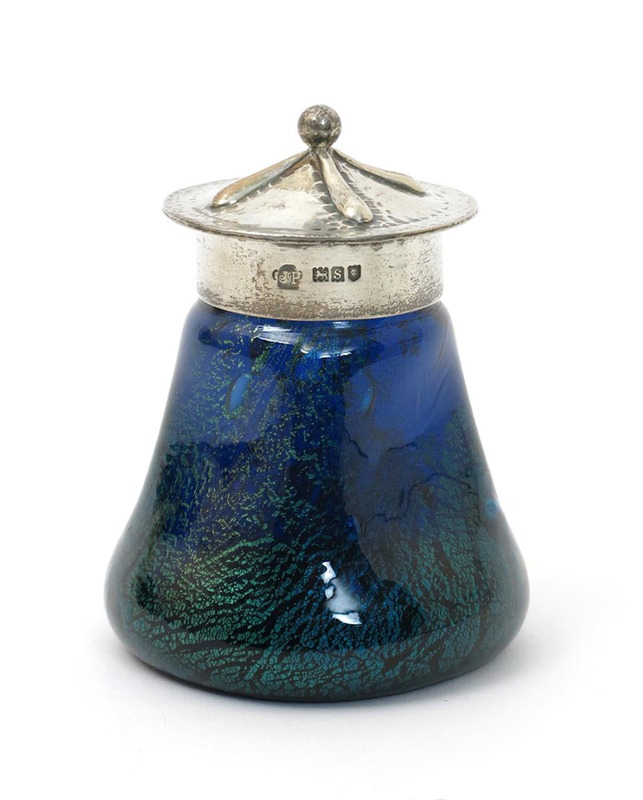 An Oxford graduate, his scientific approach to glass making occasioned innovations in both colouring and decoration (opalescent glass moved the company to new heights of late Victorian fashion) and in heat resistant glass for scientific purposes. The factory's designs, now shown at major exhibitions around the world, moved with fashion. 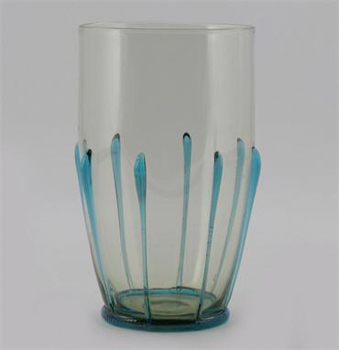 Whitefriars was the glass maker of choice for Arts & Crafts and Art Nouveau proponents such as W.A.S. Benson and Charles R. Ashbee, while the inter-War period and a move to a new state of the art factory in Wealdstone, West London in 1923 occasioned a series of colourful Art Deco wares enlivened by geometric wheel engraving. But perhaps the most iconic Whitefriars productions emerged in the 1960s as the firm (officially named Whitefriars Glass in 1963) battled to return to its pre-War prosperity. Designer Geoffrey Baxter had joined the factory in 1954 directly from the Royal School of Art. His approach to glassmaking was sometimes radical (he famously used nails, wire and bark to create his prototype moulds) but it was perfectly in tune with the mood of the late 1960s. The Textured range with its distinctive shapes such as the Drunken Bricklayer and Banjo, was released in a range of three colours in 1967. To cinnamon, indigo, and willow were added meadow green, kingfisher blue and vibrant tangerine by 1969. 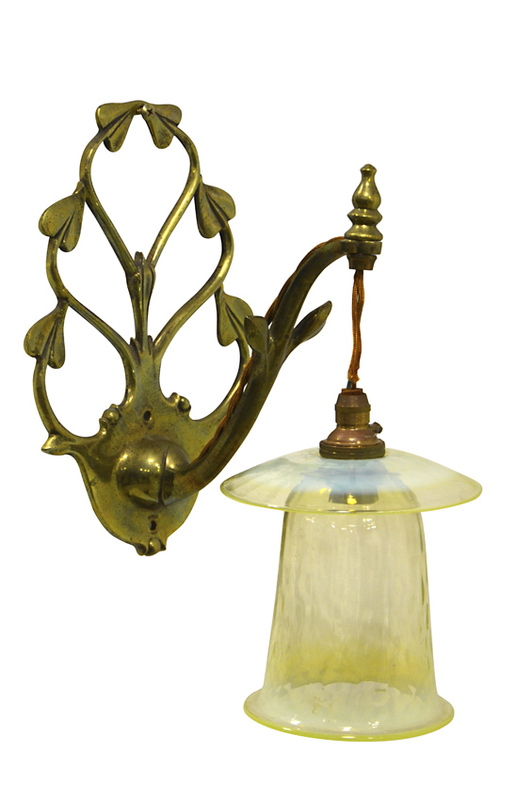 These were daring designs but the production method was quite traditional: Whitefriars glass was always hand-blown, in this case into a series of cast iron moulds. The factory hit hard times during the next decade following the loss of industrial contracts and the lack of demand for stained glass. Whitefriars continued to make Textured domestic glass, notably the new Glacier range of 1972 and a series of millefiori paperweights, but the end came in 1980. The trademark Whitefriars is now owned by the Scottish glass maker Caithness. The records and contents of the factory museum were given to the Museum of London. 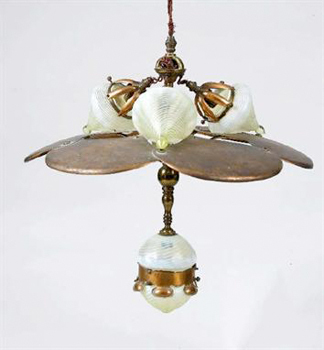 Although largely forgotten in the decades following its closure in 1980, since the 1990s glass by James Powell & Sons has undergone a serious academic and market reappraisal. This not only includes the extremely collectable earlier pieces - as important in the context of the Arts and Crafts market as a De Morgan vase or a Morris textile - but also the later Textured wares that made an important contribution to late 1960s design. Pieces from outside these aesthetic high water marks can be more affordable. 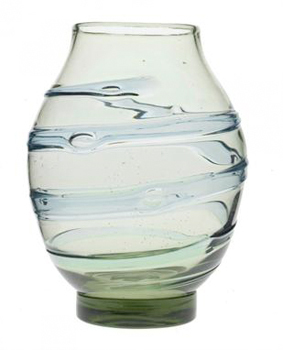 A good piece of facon de Venise Whitefriars can bring prices in the high hundreds, while there are plenty of buyers for the vaseline glass shades and vases that characterise the Harry Powell era. Clear glass tableware from the late 19th and early 20th centuries can be surprising affordable, but if they are combined with metalwork designed by Archibald Knox, Omar Ramsden, Benson or Ashbee they become infinitely more desirable. Wares from the inter-War period are perhaps undervalued although books based around the archive in the Museum of London and online articles on the subject have helped define the collecting range and make watertight attributions. With the exception of the experimental Studio range from the late 1960s, Whitefriars is rarely signed. 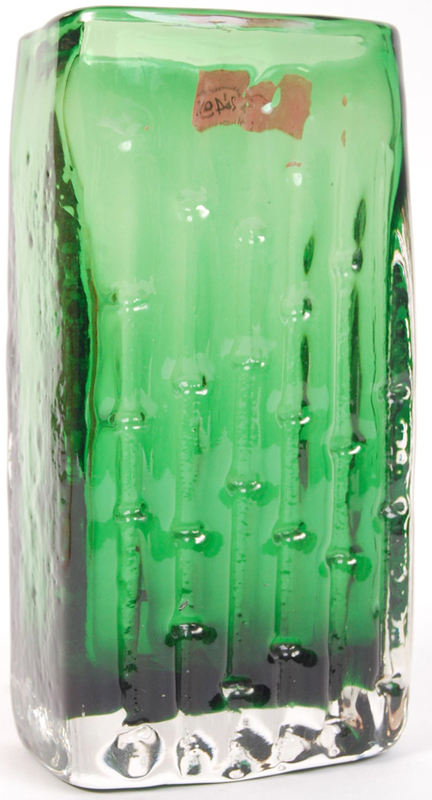 At the peak of the market, this Whitefriars large Banjo vase No.9681 Meadow Green, designed by Geoffrey Baxter, with paper model label '9681', 13in (32cm) high, sold for £1650 at Richard Winterton, Burton-on-Trent in November 2004. The great explosion in the market has been for the Geoffrey Baxter wares. By the time Geoffrey Baxter died in 1995 his contribution to the Whitefriars story had already assumed cult status and a collecting hierarchy had developed. Some shapes are more appealing, some colours are more difficult to find and some 'casts' noticeably better than others. Given that the moulds were used for many years (and slowly became worn) it is possible to date a piece of Textured Whitefriars by the degree of definition. Once the stuff of fleamarkets and eBay (where so much post-War Whitefriars is traded), since 2000 there has been a succession of ever-greater auction prices for Baxter forms, peaking around 2005 when a large Banjo vase in Tangerine would cost £500 or more, and a more unusual colour such as Kingfisher Blue or Meadow Green closer to £1500. The smaller pieces, in modish forms such as Cello, Aztec, Sunburst, Concentric TV and Guitar, were all trading at new levels from £100-plus. Today, in what remains a primarily home-based market with little input from art glass buyers in North America and Japan, prices are a good deal lower. Small textured wares begin at around £30 with most large pieces in standard colours trading at auction for £300-600. Doubtless there is a parallel to be drawn here with the market for another 1960s classic, that of Troika pottery, that has followed much the same curve. It is also important to be aware of the large number of Baxter fakes (specifically a rash of Drunken Bricklayer copies) that appeared alongside rising prices. Seemingly machine made, these initially convincing copies are heavier, the colours subtly different and they lack a polished pontil mark to the base that is a general characteristic of Whitefriars' hand-blown glass.